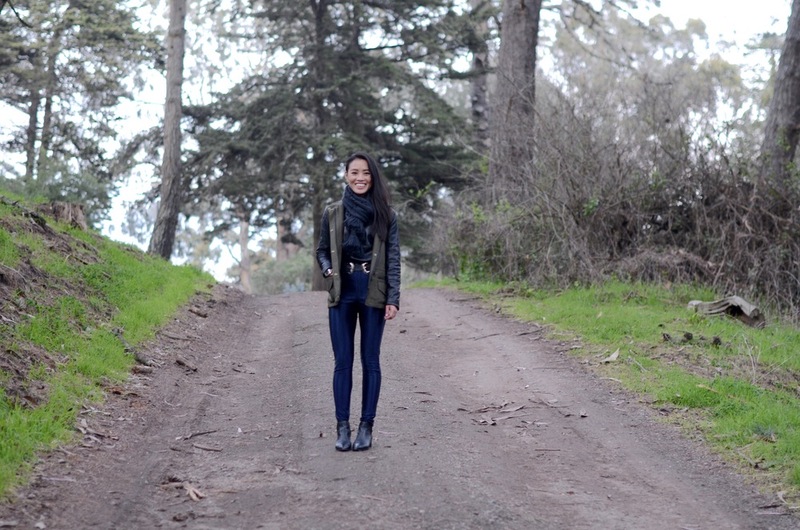 Spent the past weekend in SF and did a quick shoot as we walked through the Golden Gate park. The park is gorgeous! It's huge and really takes you away from the city. It was chilly so I wore a leather sweatshirt from Helmut Lang and these disco pants from American Apparel. I wore a thin thermal layer under the sweatshirt to keep warm, and the parka to protect from wind. Okay, maybe it wasn't that cold but I was obviously prepared! I mean, the SF wind is unpredictable...hehe. I love this statement belt from B-Low the Belt! The Western details are on trend and the adjustable buckles on both sides allow it to be worn at the waist or hips. The only difficulty was finding pants with wide enough belt loops to fit the gigantic buckle...so I simply wore it over high-waist pants with no belt loops.